Endzeit joins Annihilation in challenging us to embrace the end of our world. 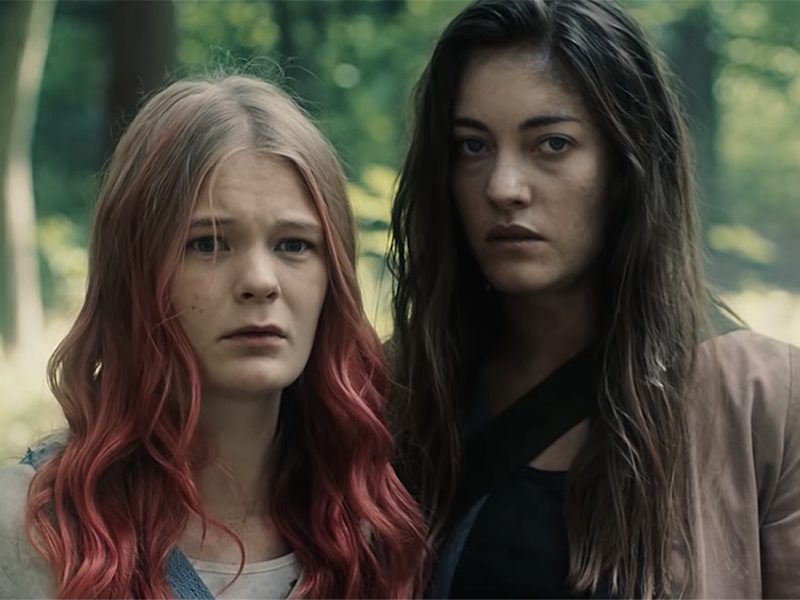 Directed by Carolina Hellsgård and based on the graphic novel by Olivia Vieweg, Endzeit, screened at TIFF 2018 (sometimes billed as Ever After) is a German zombie apocalypse movie that joins Alex Garland's Annihilation (2018) in asking whether an apocalypse is, if you will, a “chance” to create something new. The film begins years after human-zombies have already wiped out most of the human-living population, and follows two women, Vivi (Gro Swantje Kohlhof) and Eva (Maja Lehrer), as they venture outside the relative safety of Weimar, a city that survived the zombie apocalypse by its policy of mercilessly executing anyone suspected of infection, and set out for Jena, a city that's trying to find a cure for the zombie affliction. We come to understand that Vivi and Eva are a bit like the city of Weimar — they survived because they were willing to sacrifice others. But they aren't proud of that, and they want to find a different way. Their plans to reach the city of Jena almost immediately go awry, plunging them into what's partly a wilderness adventure, partly an odd-couple romance, and partly a supernatural philosophical exercise designed to consider how human life as we know it would change in such circumstances. Like Annihilation, the central question the characters have to confront is whether changing into something else — something not human — is a natural part of life. Vivi (Gro Swantje Kohlhof) and Eva (Maja Lehrer) are the standard odd-couple adventure/romance pairing. Vivi is fragile and sensitive, comically unprepared to go trudging around outdoors, taking psychiatric medication, and given to reciting poems when she's having an anxiety attack. She's haunted by the need to know what happened to her sister after the initial zombie attack, and brave enough to go outside only because she's ready to die. Eva, however, is stoic and capable, prepared to kill any zombies they meet in the wilderness. She hides her fear that she may already be infected. They argue with each other, they threaten to abandon each other, they rush back to save one another, and they share the kind of forced intimacy through the terrible events they must endure. Their wilderness adventures become a little incoherent as the story progresses, however, and the narrative starts to lose momentum in the second half. Hellsgård decided to have the story periodically jump forward in time, or she would change scenes by way of fading to black. These methods work fine at the start of the film, however, as we near the end, the time jumps begin to leave important plot details out. The most glaring example is a jump that fails to explain how Vivi was able to get out of a binding contract with a supernatural being (Trine Dyrholm, in a very brief appearance) — we fade from a scene where Vivi swears to abide by the contract directly to a scene where we see that she's completely backed out of the contract with no negative consequences. It's a weird choice, and it reflects the way the narrative fragments in places. There are beautiful moments in Endzeit. The poem Vivi compulsively whispers to herself (a poem the character may have made up) is touching. There's an interlude at an abandoned castle where we see that a long-dead family tied the sleeves of their sweaters together before they committed suicide, as if they were still holding hands. There are poignant details, like the way Eva uses a marker to paint her nails black and the way she won't throw away the plane ticket that was supposed to take her to a new life in America before the zombies attacked. In addition to starring two female leads, the film employs a number of women behind the scenes, especially in senior creative roles; e.g., Composer Franziska Henke, Cinematographer Leah Striker, Film Editors Julia Oehring and Ruth Schönegge, Production Designer Jenny Rösler, and Costume Desiger Teresa Grosser and others. That's still so unusual in 2018 that virtually every article about Endzeit makes mention of it. Indeed, it's affirming to see a deep, philosophical movie about the human condition made by and about women. Endzeit addresses our anxieties about our overpopulated, under-resourced, polluted and violent world with a compassionate mixture of fear and hope. It's message seems to be that maybe if we lean into the change that's coming we can make it into something good.